Sorry... the 2017 Buick Enclave is no longer being sold as new. Instead, take the first step to a great deal on 2019 Buick Enclave with a free price quote! 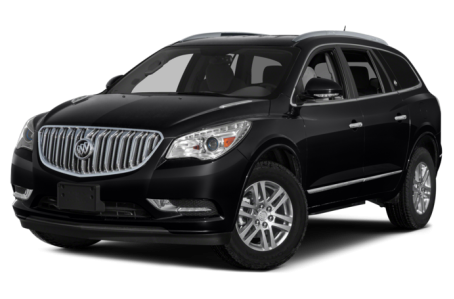 The 2017 Buick Enclave is a full-size, premium SUV that is related to the Chevrolet Traverse and GMC Acadia. It competes with Ford Explorer, Mazda CX-9, and Honda Pilot. Three trims are available: the Convenience Group, Leather Group, and Premium Group. Overall, the Enclave has a gentle, yet robust appearance. While it has some sporty elements on the frontend, the Enclave has a round, pillow-shaped body that seems more appropriate for cruising. The shield-shaped grille has protruding, vertical slats and a large, center-mounted Buick emblem. Chrome accents can be found throughout the exterior. Standard features include Xenon HID headlights, power/heated side mirrors with turn signal indicators, a power liftgate, and a dual-pipe exhaust system. Available features include a power moonroof and trailer equipment. Under the hood, the Enclave is powered by a standard 288-hp, 3.6-liter V-6 engine mated to a 6-speed automatic transmission and front- or all-wheel drive. It produces 270 lbs-ft of torque and tows up to 4,500 lbs. Fuel efficiency for the Enclave is an EPA-estimated 15/22 mpg city/highway. Inside, the Enclave features a premium leatherette interior with standard 7-passenger seating, but 8-passenger seating is available for . The second-row can be outfitted with either a pair of captain’s chairs or a 60/40 split-folding bench seat. The third-row features a 60/40 split-folding bench seat. The center stack features a standard audio system, which includes a 6.5-touchscreen, a CD/MP3 playback, Bluetooth connectivity for phone and audio, 4G LTE connectivity with a Wi-Fi hotspot, a satellite radio, and a USB port. It can be upgraded with an integrated navigation system, a DVD entertainment system, and a Bose premium audio system. Standard features include power front seats, a memory seat, remote keyless entry, and tri-zone automatic climate control. Full leather upholstery, remote vehicle start, heated/cooled front seats, an automatic tilt/telescoping steering wheel, and an automatic dimming rearview mirror are available. The Enclave earned a full 5-star overall crash test safety rating from the National Highway Traffic Safety Administration (NHTSA). Standard safety features include a backup camera, a tire pressure monitoring system, a blindspot monitoring system, rear cross-traffic alert, and rear park assist. Available features include forward collision alert and lane departure warning. sist. Available features include forward collision alert and lane departure warning. 51 of 53 (96%) consumers said they would recommend this vehicle to a friend.